Sligo, Thursday January 24th: Sligo GAA officially unveiled its 2019 jersey and kit during a special launch event at AbbVie’s Manorhamilton Road facility in Sligo today. The County Board recently told club delegates at its Annual County Convention that the company had agreed to extend its sponsorship of the county for a further three years. The biopharmaceutical company, which has two manufacturing plants near Sligo town, agreed an initial three year sponsorship deal with the county board in 2015. It saw the AbbVie logo appear on all Senior, U-20 and Junior football team jerseys, and this announcement will extend the partnership until the end of the 2021 season. 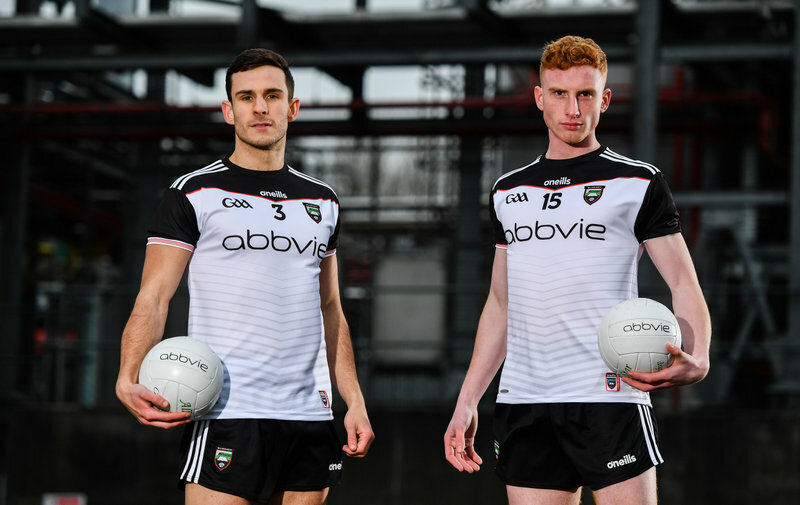 AbbVie continues to be the only multinational pharmaceutical company in Ireland to sponsor an inter-county GAA team. Members of the Sligo senior squad, including Niall Murphy and Sean Carrabine, showcased the new strip at the company’s Manorhamilton Road facility. The striking white jersey continues to feature the AbbVie logo on the front and associated sponsor branding from IT Sligo on the back. It also sports black sleeves with red detailing, dark grey shadow hoops, a Sligo crest embossed on the lower back and the title of the WB Yeats play The Land of Heart’s Desire on the collar. It is the first time the county have worn white since the middle of the 2001 season. The jersey will make its first competitive appearance on Sunday 27th of January next when Sligo begin their Division 3 campaign against Carlow at Netwatch Cullen Park. AbbVie has two plants in Sligo, one in Ballytivnan and the other at Manorhamilton Road and many of their 300 plus staff members, including Neil Ewing a former captain of the Sligo Senior Football team, are actively involved in the sport.